The human race has had a long standing struggle with finding purpose and meaning in life. That struggle has now begun to creep into our businesses and organizations, big and small. The emergence of social enterprises and purpose led organizations all point to a paradigm shift in the world of business. The mad scramble to find purpose, sometimes retrospectively, shows the extent to which this has percolated in the minds of the top honchos. Simon Sinek, best selling author and an inspirational model for leadership says: "People do business with those who believe what they believe. People don't buy what you do; they buy why you do it". Articulating the 'why' of the business is treated as a top priority by startups and corporations alike. Businesses that have stood the test of time have had to transform themselves more than once. Cutting costs and increasing output aren't sufficient factors for transformations. Existing for profits is not enough. Businesses have to evolve to send a message to their potential clients and employees about the purpose of their existence, and how they plan to positively impact the world around them. Gone are the days when all an employee wanted was a salary with some perks. Achieving job satisfaction and being a world citizen are increasingly becoming the deciding criteria. People are much more aware of the challenges faced by humanity, and they want to be a part of the solution. A business that exists as a means to solving the world's problems, as opposed to just making profits wins hands down in attracting talent and clients alike. It is the transformation that businesses are having to undergo in order to retain their place of relevance in the world. Unilever has committed to cutting its environmental footprint by half by 2020. 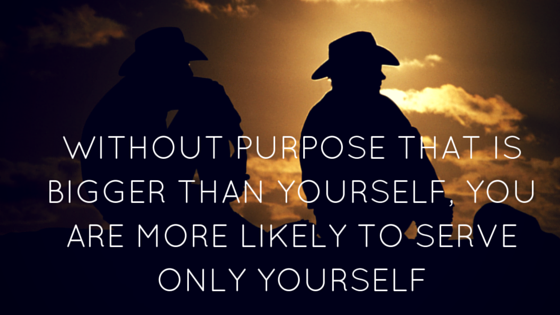 Unilever's CEO Paul Polman elaborated about the effects of being driven by purpose. He stated how the company was receiving far more engagement and much more job applicants once people realize the magnitude of their commitment in contributing to a cleaner world. Great leaders have been able to ingrain their vision into the DNA of their businesses, inspiring and uniting employees by common goals and objectives. Whether is it outstanding customer service, or top notch quality of delivered work, or changing the way people do things, the founders and leaders of businesses have a responsibility to set the vision for their employees to follow. Steve Jobs, who shaped Apple's strategy and made it into one of the most innovative and successful companies in the world, had the following purpose: "To make a contribution to the world by making tools for the mind that advance humankind." His vision shaped Apple's strategy in the early days and propelled it towards unprecedented success and popularity. A great business is one that is able to integrate a strong business model and a robust strategy with an uplifting purpose. One way to think about this is that if the business model is like the body of a business and its strategy is like its mind, then purpose is like the soul of great business organization.